And then….? What a random place to finish. Where was the lavaaaa? *whinges* I thought this book was going to be less dystopian aftermathy and more ‘HOLY EFF THERE IS LITERALLY LAVA COMING AFTER US RUUUUN’. But that’s just me who watches Dante’s Peak every time it is shown on ITV2…. Which is surprisingly a lot. Also, one thing that struck me (mostly at the beginning, actually, it kind of calmed down as the book went on) was how much Mr Mullin really liked his dramatic chapter ending sentence. It all just got a bit too much…. Also… the ending bothered me… it just seemed really abrupt. Oh I loved Alex. Mullin created a great character with Alex and considering he found himself in the worst situation you could imagine, he remained strong and so resourceful (seriously, I’d have just parked myself on my drive to wait it out) and persistent in his quest to find his family. Alex didn’t try to be a badass or become broody/ whingey about his situation but he just got on with things, doing a fantastic job at looking after not only himself but other people around him. Mullin’s portrayal of Alex transforming from a moody teenager into a brave, courageous and moral adult was particularly well-written and moving. He was also hilarious and a typical boy at times that had me laughing out loud on many occasions. Oh and he knows taekwondo and can chop you into OBLIVION. Yeah, that’s right. She gets her own heading. None of this best friend/love interest nonsense for this lady. Darla is amazing.She’s no nonsense, feisty, sarcastic, vulnerable, sweet and she can skin a fricken rabbit and gut a pig without crying like a small child. And she has a toy boy and she wears the (albeit a little ashy) pants in that relationship. Surprisingly, there are not many songs about SUPER VOLCANOS. I know, weird, right? Geddit? Also.. I’m pretty sure that the lava (that there was NO MENTION OF) would burn…baby, burn. 8/10. There is a section just after half-way in this book that absolutely trod on my heart. With heavy boots on. And then stilettos. But I want you guys to suffer like I did read that without spoiling it. As I come from a place where the only real threatening weather/natural disaster is floods, it would normally have been difficult for me to imagine what it would be like in Alex’s shoes. But, with Mullins’ brilliant vision of what it would be like (even if it is just speculation) and the exploration of not just how geography would change but how humanity (or, lack thereof) would be affected was brutally realistic and, unfortunately, not that difficult to imagine actually happening. And that scared the living bejeesus out of me. People who are looking for a new take on dystopian fiction. People who love pancakes. People who can ski. People who like camping in the great outdoors…. Surrounding by mountains of ASH. People who have seen better equipment on goats. People who don’t like rabbits…. Or pigs. People who hate getting ash in their kecks. People who worry about where they’d get condoms from if there was a natural disaster. People who always think of Pierce Brosnon in potentially life threatening situations, until Mama Mia… when his career became life threatening. I received an advanced copy of this book from the publishers. Hey! Found your blog on Goodreads (from your Eve review, heh) and am following your blog now ^^ Love your reviews, they're great to read! 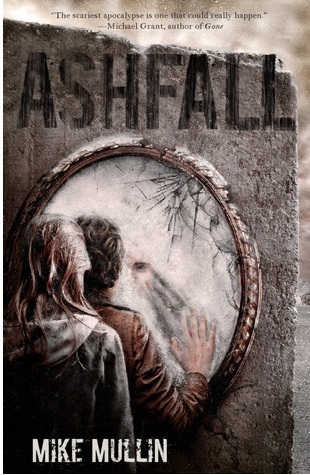 I also read Ashfall and I agree with many of your points! It was nice to read something really different in the apocalyptic genre, although yeah, I think we needed more lava … hahaha! Yeah, interesting is the right word. It's a great premise and it was really intriguing and different but there was a few bits and pieces that I wasn't completely sold on. The movie scenes where people outrun pyroclastic flows are ridiculous. They move at up to 700 kph off Plinian volcanoes like Mt. St. Helens. Presumably they would move even faster from a supervolcano. The slow lava type of volcano is a shield volcano, like the ones in Hawaii. Anyway, sorry to bore you with volcano trivia. Thanks again for the excellent review! Lol! Love this review! I have this one to read from NetGalley – but haven't got round to it yet because I'm kind of drowning in books! Seriously, they keep toppling over onto me in my room as I now have them piled up on the floor! This is an action packed and incredibly realistic story that will keep you reading well into the night. One of the best books I have read this year. A definite must read. WOW!!! Outstanding book.